In an exclusive interview on DW’s Conflict Zone, Colombian President Juan Manuel Santos denied his low level of public approval would jeopardize the peace he negotiated for over four years and said the process was already underway. “Peace is irreversible. There is no way back,” he said. But violence has spiked in Colombia following the peace agreement, with dissident rebels and drug gangs seeking to take over in areas formerly under the control of FARC guerrillas, who waged an insurgency in the country for more than half a century and have largely been demobilized under Santos’s peace deal. Human rights defenders, activists and protesters have also been targeted with 441 attacks recorded in 2017, including 121 murders. Santos won a Nobel Prize in 2016 for his peace agreement, but his international plaudits have not translated into popularity at home. In March, his approval rating was 14 percent, with just 17 percent expressing support for his amended peace deal. He narrowly lost a referendum on his original peace plan in October 2016, when 50.2 percent voted against it, on a turnout of less than 38 percent of voters. Santos told Tim Sebastian he had underestimated the opposition to the deal, which he signed along with FARC leader Rodrigo Londono, known as Timochenko. “I was wrong … Referendums are answered for reasons different from the particular question,” Santos said. After the failed referendum, an amended deal was passed by Congress without going back to voters. It includes a guarantee of five seats for the FARC in Colombia’s Chamber of Representatives and Senate. Of the recent violence, the Office of the UN High Commissioner for Human Rights in March voiced its concern over accusations that the army and police had contributed by committing 11 extrajudicial murders in 2017. Thousands of innocent civilians were systematically killed by the military in the early 2000s and presented as rebels to inflate statistics and gain promotions or bonuses. 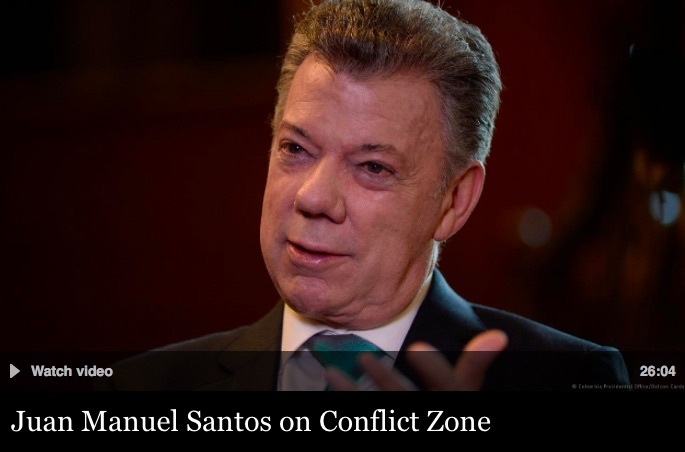 And those responsible for false positives, they have to go to the transitional justice and be judged and condemned,” Santos said. In May, a former police colonel said approximately 10,000 may be have been murdered as “false positives” between 2002 and 2010, a figure which Santos disputed on Conflict Zone. On the ongoing war on drugs, Santos said the world has a “wrong approach to the drug problem,” costing Colombia dearly and keeping it the world’s biggest exporter of cocaine. In June, a US government report said cocaine production in Colombia had increased by 19 percent, prompting a warning from Donald Trump to reduce it. When Tim Sebastian confronted the outgoing president about blaming consumers when Colombia’s drug market makes huge sums of money for many people in the country, Santos said it was “a co-responsibility” and that he wanted more support from countries consuming cocaine.